Did a race of ancient giants once inhabit the Americas? Do ancient megalithic stoneworks, out-of-place artifacts, DNA mysteries, and strange bones provide proof of their existence? 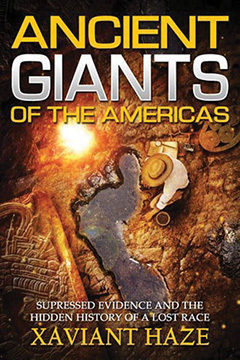 Ancient Giants of the Americas reveals an array of astounding truths, including: How giants were a dominant feature of Native American origin myths; Extraordinary first-person tales about meetings with giant Native Americans; How early pioneers discovered the remains of ancient giants and a previously unknown civilization—and how the Smithsonian successfully covered them up. Analyzing the historical and archaeological evidence, Haze provides ample proof that our ancestors in the ancient Americas were much taller than we imagine. Their exploits inspired the Native Americans to keep oral accounts of these mysterious giants, who left behind strange artifacts, massive mounds, and the remains of a vast copper mining network. Who were these ancient giants? Did some really have six toes? Were some related to the elongated-skull peoples of Peru? ANCIENT GIANTS OF THE AMERICAS: Suppressed Evidence and the Hidden History of a Lost Race By Xaviant Haze. 192 pages. 6x9 Paperback. Illustrated. References.